Vincent Pouliot. International Security in Practice: The Politics of NATO-Russia Diplomacy. Cambridge: Cambridge University Press, 2010. Vincent Pouliot, author of the book, International Security in Practice: The Politics of NATO-Russia Diplomacy (Cambridge University Press, 2010), proposes a fascinating practice-based analysis of post-Cold War security and diplomatic relations between two former bitter rivals, the Russian Federation and the North Atlantic Treaty Organisation (NATO). In the spirit of the “practice turn” in International Relations literature, Vincent Pouliot expands the constructivist theoretical research agenda of security communities, by studying the practical sense of security and diplomacy high-ranking actors. 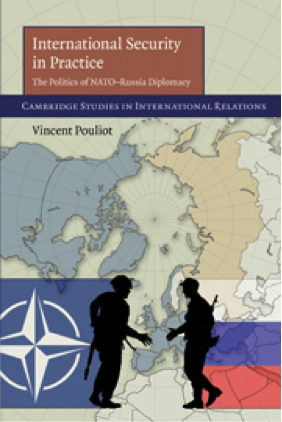 By using both historical and qualitative interview-based analysis, Pouliot concentrates on the recent history of diplomatic encounters between the two former enemies, Russia and NATO, and traces the normalisation patterns of their diplomatic interaction. The author stresses the fact that advancements to construct a trust-based security community between NATO and Russia are limited in practice, due to old animosities, latent mistrust, escalating symbolic power struggles and turf-wars, as well as perceived threats by Russia as regards NATO’s enlargement. The analytical focus is given to the formation of transnational diplomatic security communities; the empirical interest is centered on NATO-Russia diplomatic relations post-Cold War. By putting forward a theoretical agenda inspired by French sociologist Pierre Bourdieu, the author develops an innovative “sobjective” methodology that empirically studies security actors’ and diplomats’ practices. The book offers a paradigmatic theoretical shift in International Relations theory and Security Studies with an original theory of the practice in security communities. The author proceeds to examine the failed attempts to construct a security community after the Cold War between Russia and NATO by examining practitioners’ interactions within the NATO-Russia Council[i]. The failure is mainly attributed to NATO’s incapacity to “seduce” and coax Russia into a communitarian style of doing security. The author rightly observes that when the diplomatic practices of peacefully settling disputes are taken for granted and self-evident, then violent confrontations are sidestepped. Conversely, when there is a clear incongruity between the background knowledge and habitual dispositions of practitioners and new security situations and changing rules of the diplomatic game, symbolic power confrontations can turn into violence and open conflict. According to Pouliot, a Bourdieusean-inspired analytical framework is capable of identifying the relevant security and diplomacy practitioners with the symbolic power to influence the international security agenda and control the advent of violent conflicts. The interplay between such competing actors and groups in the case of NATO-Russia relations is manifested in the competition over the monopoly of security articulations. Practitioners struggle over their symbolic positions within the international security field, with a view to influence the existing power hierarchy and the conditions that lead to shifts in the geopolitical status-quo. The Bourdieusean-inspired framework is able to encompass the dynamic mobility of such practitioners across diplomatic and security fields and their struggle over the top positions on the hierarchy ladder of power politics. Especially in the realms of security and foreign policy making, the security and political fields are populated with high ranking officials that embody authoritative descriptors, translated in their political and military positions and the power politics nature of their daily practice. How such actors manage to (re)convert their expertise and prestige and use them across specialised security fields may be an indicator of the international security fields’ transformation and trans-territorialisation into what is considered to be a security community. A security community is defined in the line of Karl Deutch’s original conceptualisation, “a security community is an interstate group of people among whom there is a ‘real assurance that the members of that community will not fight each other physically, but will settle their disputes in some other way’” (Deutch 1957; Pouliot 2010:3). Nevertheless, the author stresses the fact that “the key mechanism of security community development: we-ness or collective identification” (Pouliot 2010:5) is not manifested in the case of mutual representations between Russia and NATO member states. From this point of view, Pouliot argues that contrary to common interpretation, security communities are not characterised by the absence of conflicts, but rather by the fact that such disputes are settled through diplomatic processes. In the case of Russia-NATO relations, interest is given to diplomatic encounters responsible with handling disagreements through everyday practice. According to the authors, “diplomacy is an art, not a science” and it “is practice enacted in and on the world, in real time and with actual consequences for the practitioner” (Pouliot 2010:16). Preferences and strategies, representations and beliefs, all have social origins and can be identified in the habitual dispositions of diplomacy and the work of security practitioners. The security professionals’ and diplomats’ rational instrumentality and norm-following could be determined by non-rational and non-normative elements, namely socially-determined practices in a given professional field. Diplomats’ interests and beliefs are thus a result of historically ingrained habitual behaviors and dispositions. By looking at what Michel De Certeau terms “the commonsense of everyday practice”[ii] of security production and reproduction, the research attention in the book falls on diplomatic practices with both their material and discursive dimensions. Captivating interview responses from both Russian and NATO security practitioners illustrate the above point, the author devoting his attention to tacit assumptions, practical logic and activities performed on an everyday basis by the interviewees (Pouliot 2010:83). Colorful interview answers are provided in the book as exemplifications of inherited and deeply ingrained disposition illustrating the Russian mistrust towards NATO: “Of course NATO’s main duty is to plan war against Russia. This is a well-known fact.” (Pouliot 2010:106). On the NATO side, one interviewee states that “I’m still skeptical of the Russians. Russia wants to influence NATO, and the NRC makes mischief making easier. Russia looks for opportunities to exploit differences among allies” (Pouliot 2010:106). Such illustrative responses point towards the fact that outdated, Cold War mentalities are pervasive instances still plaguing NATO-Russia relations, being manifested in symbolic power struggles and in the general perception that “what is good for NATO, it must be bad for Russia” (Pouliot 2010: 107). The book is a worthy read especially because of such fascinating inside glimpses into the reasoning of security practitioners and their respective beliefs. As “knowledge that does not know itself”[iii], practical knowledge is not effortlessly perceptible in scientific analysis, security actors’ practical feel of the game[iv] and their habitual dispositions lending a helpful hand in empirically operationalising the logic of practice[v] in the case of NATO-Russia relations. By following this line of reasoning, Pouliot advances the theoretical viewpoint that interests and identities are produced through social practices. What is mostly interesting is not so much measuring or explaining strategic culture outputs by looking at culture or interests, but by focusing on the concentration of actors and their strategies and relations that made the diplomatic encounters possible in the first place. In the author’s words, in this way he is “able to learn a great deal about what NRC (NATO-Russia Council) practitioners do in and through practice” (Pouliot 2010:83). The book does an excellent job of reconstructing the know-how of security and diplomacy practitioners from both the NATO’s and Russia’s perspectives and teases out the practical undercurrent of their interactions post-Cold War. The disheartening conclusion is that sometimes diplomatic and security behaviors are not a result of rational cost-benefit analysis or substantive, normative beliefs, but they are rather a result of “inarticulate, practical knowledge that makes what is to be done appear self-evident or commonsensical” (Pouliot 2010:12). [i] The NATO-Russia Council, http://www.nato-russia-council.info/en/. [ii] M. De Certeau, The Practice of Everyday Life, University of California, 2002. [iii] Pierre Bourdieu, Outline of a Theory of Practice, Cambridge University Press, 1977. [iv] Pierre Bourdieu & Loïc Wacquant, An Invitation to Reflexive Sociology (The University of Chicago Press, 1992), 120-121. [v] Pierre Bourdieu, “The Social Space and the Genesis of Groups” in Theory and Society 14 (November 1985), 723-744. This entry was posted on 12/03/2014 by ISIS Europe in Contributors, Raluca Csernatoni, Reviews and tagged Diplomacy, Foreign Relations, International Political Sociology, International Relations, NATO-Russia Council, NATO-Russia Relations, Russia (Federation), security, The North Atlantic Treaty Organisation (NATO).